Find a Hiking & Trekking trip that explores France And Italy. There are 14 tours to choose from, that range in length from 5 days up to 15 days. You will visit outstanding places like Courmayeur and Les Houches! 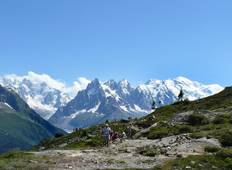 "The Mont Blanc Highlights was an amazing tour! The room at the chalet where we stayed..."
"Glad I was able to complete TMB. Scenery is gorgeous, refuges were comfortable and..."